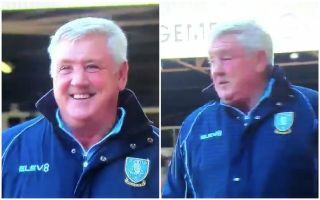 Sheffield Wednesday boss Steve Bruce appeared to be given a fright by a ghost during his side’s clash with Leeds United on Saturday. His side fell to a 1-0 defeat at Elland Road, which arguably all-but ends their slim hopes of making a late run for the playoffs in the Championship this season. However, there was a rather odd clip that went viral on social media during the game, as seen below, which shows Bruce seemingly getting a spook despite nothing being around him. It all starts happy enough as he has a beaming smile on his face as he shares a joke with one of the players, but it suddenly gets very bizarre as it brings back memories of Mick McCarthy getting frightened by a ghost, as seen below. We’re not sure what it was that spooked Bruce, as it may well have been a very, very delayed reaction to the ball going over his head from behind.